The accusation that supreme court candidate Brett Kavanaugh grabbed and grappled with a girl at a party in an attempt to have his way with her has sparked much comment and conversation about the goings on in high school. While high school kids everywhere are always testing the social boundaries, there is no common high school experience--except for the academic studies. And they vary widely. A professional friend of mine is an expert on the subject of what goes on in high schools. I got to know him when he was a counselor at a high school where my spouse taught. He was known for being unusually effective in his work and had dealt with some very violent situations. He became nationally known for his knowledge and skill, and became part of an organization that schools bring in to help the staffs solve problems. He makes the point that high schools are extensions of their communities. They are expressions of social values on which the communities operate. If a community has serious issues of social and economic inequality, those issues will be reflected in the way the school is run and in the attitudes of the student body. His operating principle was that schools could not change a community, but they could act as a beacon which helped students recognize factors which could limit them and show them the way to surmount those factors. The last time I had an extensive exchange with the counselor was when he met with co-directors of the Dakota Writing Project to review the relationships the Project had with local schools and to formulate plans to make those relationships as effective as possible. The original Dakota Writing Project was headquartered at Northern State with co-directors at Dakota State and Black Hills State. I was a co-director and for a few years the principal director. The Project was a totally teacher-run enterprise. Its operation was based on the premise that talented and experienced teachers had developed strategies for teaching and developing student abilities that grew out of actual experience in the classroom. While experts were called in to discuss these matters with local teachers, the Project's purpose was to draw out the successful experiences from the teachers and make them available to all teachers who are also searching for ways to engage their students and elicit competent and strong achievements. Writing Projects throughout the nation were able to show marked gains in student achievement. Our task was to aid teachers in organizing and implementing the programs. We had no problem in generating the interest and participation of teachers, but they often encountered resistance from school administrations which did not want autonomy among the teachers. The counselor discussed with our Project members what they encountered and what were options for dealing with obstructions. The counselor categorized how schools characterize themselves. He said that very often you could determine a school's priorities by walking down the hallways during a change of classes. The way students dressed, comported themselves, and interacted with teachers communicated much about what values guided the running of a school. He said that in some schools, you could feel a sexual tension when you entered the building. The girls dressed and comported themselves in ways that competed for attention and demonstrated that they thought in terms of a pecking order. The boys displayed their attitudes by who they paid attention to. When students were interviewed, they talked in terms of status and who were important. Sometimes, he said, this attitude was apparent among the teaching staff. These schools were run by cliques and students in the less prestigious cliques had disparaging attitudes about the school and education in general. It boiled down to the community's attitude toward equality. Those schools which serve the quest for social status have students with out-of-school life for which a major activity is drinking parties at which sexual encounters are involved. The high school experiences for many students in these schools have been dominated by this social order. Memories of school for the students, both those who participated in the parties and those who didn't, are of bitter social divisions and debauchery. In communities where inequality rules as a social order, some schools are an extension of the inequality whereas others provide a refuge from it. It is that latter function that the counselor said dedicated educators strive for. Schools that surmount social divisions focus on the future of children, not the divisive attitudes of people in the community they serve. The counselor said many schools are still segregated. Not racially segregated, but by economic, social, and religious divisions. However, most educators have had a required course in the foundations of American education, and adhere to the principles for maintaining a democratic society. They believe that the survival of American democracy depends on people who know how to get informed and subject information to critical thought. Many schools have submitted to the pressure to turn out students who will be docile workers who will never question authority. The fact that such a large segment of Americans decry anyone who questions the authority of Donald Trump shows how many schools have become instruments of inequality. As the nomination hearings for the Supreme Court have shown, the legacy of those schools which serve the presumption of privilege was put on display. Brett Kavanaugh threw a hysterical temper tantrum in which he asserted false conspiracy theories, and he was praised for "fighting back" in the Trump manner. The fact that a nominee to the Supreme Court would do so on national television exhibits what has happened in our schools. And, therefore, in our nation. The bitter political divisions in America have turned some traditional election activities into risky actions. Election campaign signs are intended to familiarize people with candidates and their names, and to create and interest in and show support for the candidates by the people who display their signs. However, by displaying partisan signs, people are applying labels to themselves that identify them as enemies to the opposing party. The problem is that the political dialogue in our country has deteriorated into exchanges of hate speech. Donald Trump is the result of a degeneration of thought and word that has been at work for a couple of decades, at least. People hardly ever state political disagreements in reasoned and respectful terms. Rather, they call the opposition demeaning names and accuse them of degenerate things. Their words do not inspire thought, but provoke anger and a desire to lash out. Mindless anger has displaced rational thought as the currency of politics. The seeds were planted decades ago with midnight talk radio in which "hosts" would introduce some insanely provocative topic and invite people to call in and comment. To keep the phone lines busy the hosts would encourage the ignorant, the stupid, and those possessed by some demented obsession to vent over the air. The audience for the talk shows had two major components: those people of limited intellect who were ignored in general society; and those who were entertained or made to feel superior by foolish rantings. Talk radio gave the stations a surprisingly substantial audience during the gloomy hours when most people were asleep. It was a refuge for the superstitious, occult, and spurious, and popular enough so that national programs could network throughout the nation and give local radio stations a cheap way to fill the dreary hours. Talk radio became the foster home of conspiracy theories. It nourished and propagated them. It gained such an audience that it was moved to prime time with the likes of Rush Limbaugh who became the voice of American conservatism. His harangues became the model for conservative political discourse. Limbaugh's response was to conduct a defamation campaign against fact checkers. For the ignorant, stupid, and hateful souls who were possessed by the worst demons of humankind as opposed to Lincoln's better angels, Limbaugh and his emulators legitimatized mindless scurrility as a mode of political discourse. Donald Trump has totally adopted the Limbaugh playbook for lies, insult, and abuse as his mode of communication. By this summer, he was recorded as telling more than 4,200 lies to the public during his term of president. His supporters, of course, claim that the liberals are the ones guilty of making up malicious accusations. Consequently, the contest between Republicans and Democrats has devolved into each side regarding the other as motivated by a malicious dishonesty. This contempt affects the way the way people hear and read political messages and how they perceive campaign signs. I have examined responses, including my own, to signs in an effort to understand how people read and react to them. The hateful dialogue of contemporary politics has established the context that controls the responses. Rather than registering the name of a person on a sign and endeavoring to assess the qualifications of the individual, the first impulse is to determine what party the candidate belongs to. If the person is a Republican, he or she becomes associated with Limbaugh and Trump and the people who endorse them. Such association labels them as enemies of democracy. And when conservatives determine that a sign is for a Democratic candidate, they associate the displayer of the sign as a communist or a socialist or a bleeding hearted snowflake or whatever label the conservative media uses to denigrate Democrats. So, when people move about town and see signs in private yards, they identify the householders as Republican or Democrat. And accordingly, they decide if that neighbor is an ally or any enemy. They are reacting to the insulting, defaming, and threatening political discourse that has conditioned their response to the opposing party. When it comes to inspiring hostility, the GOP has a strong edge over Democrats. It has developed personal attacks and defamation as effective campaign tools. There is no dispute that appeals to hate win elections for them. 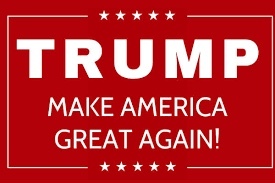 When Democrats and independents see a GOP campaign sign, they automatically associate it with the scurrility that comprises many Republican campaigns. 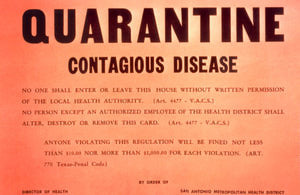 Political signs send a quarantine message to stay away from the people who display them. JT, the managing editor who had spent decades as a city hall and police reporter, said police scandals within a department broke about every ten years. Then the department would follow a ritual of winnowing out the misperformers, and a new batch of them would develop. He said the problem was with the personality traits and motives that made people want to be police. They may say they want to serve and protect in the interest of law and order, but many really want the opportunity to f***k over people with their authority. He also said that dealing with the lowest and meanest of humankind on a regular basis warped the human spirit, and many officers developed a doubtful attitude about humankind. However, JT had close friends who were or had been police officers. When police scandals broke, JT would consult and often get quotes from them from the police perspective. One such quote came up after a strange, but somewhat funny incident. That night a very senior police detective visited an old friend, who was a woman who had owned bars where gambling, among other things, went on, and they sat in his police cruiser and reminisced about the good old days when she paid for police protection. Somehow the detective left the switch for his radio microphone on, and the entire conversation was broadcast on the police band. Reporters who were working the night shift at the Moline, Ill., Dispatch heard it on the scanners in the newsroom. The scanners had voice-activated tape recorders, so the conversation was on tape. The conversation was reported in a news story, but it did not result in any court actions. The evidence of a department on the take in the past was embarrassing to the department and to former city officials. There was some reshuffling and sudden retirements in the police department and the incident became the spark of anecdotes and memories of the past. A quote came from a former chief of police and friend of JT's: "There are good cops and some who never should be cops, but most are just people trying to make a living like the rest of us. And if they are good cops, they know their jobs and do them. The cases of graft are more matters of the pay scale, and that's the first thing to examine if your cops are augmenting their salaries with early warnings or ignoring back room activities. I hated having to fire cops because they were poor." And that leads to the story about Claus, a long-time chief of police in Rock Island, the town abutting Moline on its western border, and Mills Cafe. Mills Cafe was notorious, as was the 101 Club by the Centennial Bridge over the Mississippi River to Iowa. They were brothels. They were fixtures so prominent that most people in the area knew about them by the time they entered high school. The clamor to do something about them was constant, so the police raided them periodically, but never managed to do so while business was being conducted. Until one night in the 1960s. The state's attorney and the sheriff's department raided Mills Cafe and found the place bustling with business. They hauled Jenny Mills, her staff of young women, and some customers over to the county jail for booking. Jenny Mills' first telephone call was to the home of Chief of Police Claus during which she told him she was arrested, and asked just what the hell was she paying him for? Thus ended the careers of Jenny and Claus. Claus had not managed to give Jenny a warning that a raid was coming, as had been an arrangement of many years. That was because he didn't know. His department was left out of the loop. Moline's chief of police stepped into the news last week when when he was stopped by an Iowa state trooper going 90 mph in a 65 mph zone. Then he blew a .201 on the breathalyzer. In Iowa the percentage at which one is legally drunk is 0.08. Two Moline police captains were in the truck with the chief when it was stopped. They are all on suspension. There have been problems with chiefs of police and other officers up here in Aberdeen. Early in this century, the Aberdeen police department went through a flurry of firings and resignations of police chiefs, detectives, and officers with a lot of infighting. It was almost as if Trump was running the department. The difference between what goes on in Aberdeen and Illinois is that in South Dakota the people are never told what is going on. When officials in South Dakota screw up and screw around, the rule is that it is none of the people's business what officials are doing with their tax money or in their behalf. State law provides many loopholes through which truckloads of corruption and incompetence may be driven. And officials can always fall back on the ploy that it is a personnel matter and personnel matters are confidential. In Illinois, people are so backward that they think what goes on in government and those who work for them must do so with the people's consent. So, all matters of how government operates are personnel matters and the people, Illinoisans think, damned well better be told about it. There is a lot of corruption and foolery in Illinois and we know about it because it has been exposed and dealt with. A number of recent Illinois governors have served jail terms. South Dakota has had the EB-5 and Gear Up scandals and the people tend to think it is really none of their business. And no disciplinary action has been taken. Corruption is considered good economic policy by many South Dakotans. In Illinois an inebriated police chief racing around Iowa with two of his captains is considered public business. Police misconduct falls into distinct categories. Some departments have a culture of intimidating and shaking down people for bribes. Groups of police in larger cities have run elaborate criminal enterprises. Some police set up individual arrangements of corruption, as did Chief Claus. Sometimes personal failings such as addictions are involved. And there is the matter of police brutality and the individuals prone to it. What brings all this to mind is the police response to the Colin Kaepernick-led protests against police gunning down black men, many of whom were unarmed. Police unions have joined Trump in contending that the protests dishonor the military and the first responders. The protests are the result of the undeniable fact that unarmed black men are a constant target of police bullets. The police union complaints are gravely troublesome to those of us who support the unions. Rather than take leadership within the profession to acknowledge the problem, examine it, and offer solutions, they join Trump and further excoriate the people they are exterminating. They echo the Gestapo knocking on the doors of Jews. And their refusal to confront the problem gives further reason to distrust the police. Meanwhile, the protest against the police shootings has taken form around specific incidents. The shooting of Philando Castile in a suburb of St.Paul, MN, has become an icon concerning the police in the minds of many. Castile was pulled over ostensibly because of a broken tail light. The policeman who shot him, however, said he resembled the picture of a bank robber in a wanted poster. Castile's girl friend was sitting in the passenger seat and recorded the stop on her phone. Her four-year-old daughter was in the back seat. When Castile tried to get his identification. the officer shot him five times. The officer was charged, but was acquitted in a jury trial. Those fives shots blasted and the acquittal blew away any pretenses that America is a country of liberty, equality, and justice. Philando Castile and scores of bodies of dead black men gunned down by the police show that the United States is replacing the Third Reich. One of the latest bodies to be thrown on the heap is that of Botham Jean in his own apartment. A police officer who lived on the floor below him entered his apartment by mistake and shot him because she said she thought he was an intruder. God bless America. The vast majority of police "know their jobs and do them" well. They don't strut around claiming to make life possible for all the rest of mankind. And people appreciate when police come in harm's way in dealing with the lethal elements of society. But police unions have established due process procedures that give police accused of misconduct extensive access to protections of justice. That is something that is denied men like Philando Castile and those many whose right to life has been denied by police bullets. Those who defend indiscriminate killing and want punishments for protesting it are standing up for Third Reich rule. The protesters are the defenders of liberty, equality, and justice. In the age of Trump, the irony of alleged defenders of American values being the ones blowing those values away is lost. If people want a Third Reich system, they can't claim to be defending America. The country they want is not the one many of us served and defended. When you let idiots lead, you become one. It is wrenching to watch a person deteriorate. Families often have to deal with elderly family members beset with dementia and Alzheimers. The severity of the situations vary greatly, from forgetfulness and mental fogginess to radical changes in personality in which a once nice and pleasant person becomes angry, malevolent, and dangerous. My mother had a perspective on dementia that I have discussed with colleagues in psychology who say it has merit. My mother's mother had severe rheumatism which required her to use a wheelchair. One day when she was getting out of the wheel chair into her bed, she didn't set the brake firmly, and the wheel chair scooted backward, dumping her on the floor. She broke her hip, and was not able to walk at all afterward. For 16 years after her fall, she was an invalid in our house, cared for by my mother. My grandmother did not have mental issues, and was aware and coherent until her death at 98 years. My mother had visiting nurses come in and learned much from them in the care of invalids. After my grandmother died, the nurses encouraged my mother to become an LPN (licensed practical nurse) because they were aware of many instances when elderly needed acute care and they thought my mother was very adept at it. So, my mother, in her sixties by then, obtained her license and took referrals for helping to care for elderly people. During her work, she had some difficult cases in which the patients were mean. Alzheimer's Disease had not been scientifically defined at that time and was barely recognized or distinguished from other forms of dementia. My mother learned how to handle such patients so that they could receive care and treatment. However, she made an observation about some that led her to say that the dementia of aging was used to excuse the behavior of people who had been mean and vicious all their lives. I can remember one case of a man who had been a prominent businessman. My mother was called to help care for him when a nursing home asked him to be removed because he was disruptive and a menace to other patients. His family hired an orderly to attend to him, and my mother made daily visits to provide the medical care. His wife, a frail, aged woman confided to my mother that his children did not want anything to do with him because he had abused them and her all his life. My mother encountered other such cases. She was a devoutly religious woman who never angered or disparaged other people, but she commented how such people strained Christian charity. She said you can't place the blame on dementia when they have been vile all their lives. In a conversation I had with a fellow professor in psychology who had also been a minister, we discussed what my mother said. He said it was true: people use aging as a convenient explanation for mean and vicious behavior that is in fact part of some personalities. He said such personalities gave him moments as a minister that led him to seek another vocation. Trump exhibits all those traits that denote a vile personality. He lies constantly, he insults and defames others, he shows no ability to apprehend facts or engage in rational thought. A number of articles and a book by mental health professionals have recorded the symptoms in Trump of dementia. A recent article contrasts his current state of mind with an earlier Trump. However, his biographers claim he has also been dishonest and intellectually inept. A retired commercial banker told me stories about how detested he was by the Chicago business community in the 1980s for his unscrupulous business practices. One story was about a person bringing him to lunch at an exclusive businessmen's club. When he came in, the other businessmen there left their lunches and walked out and lodged a complaint with the officers of the club. Their complaint was that Trump's presence tainted the club and its members with a disreputable association with him. 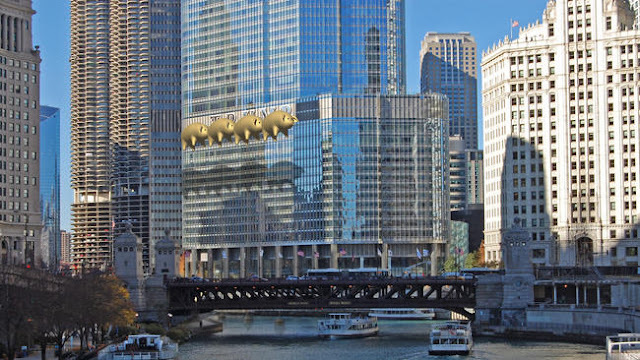 The lingering detesting of Trump in Chicago was evident when after his election, architects planned to float pig balloons in front of his hotel to block out his name. Chicago architects' plan to block Trump's name with floating golden pigs. The evidence is not that Trump has undergone mental deterioration. As my mother put it, you can't blame his behavior on dementia; he has been a vile person all his life. A plurality of Americans chose Trump to be their president. They can't say they weren't warned. In the world, there are places where smarter people live. We can only hope our children find those places, or at least follow their example, while the idiots of America run amok with their version of greatness.